Sup dawg, I heard you like electronic accessories. Here are my favorite accessories for my favorite accessory. 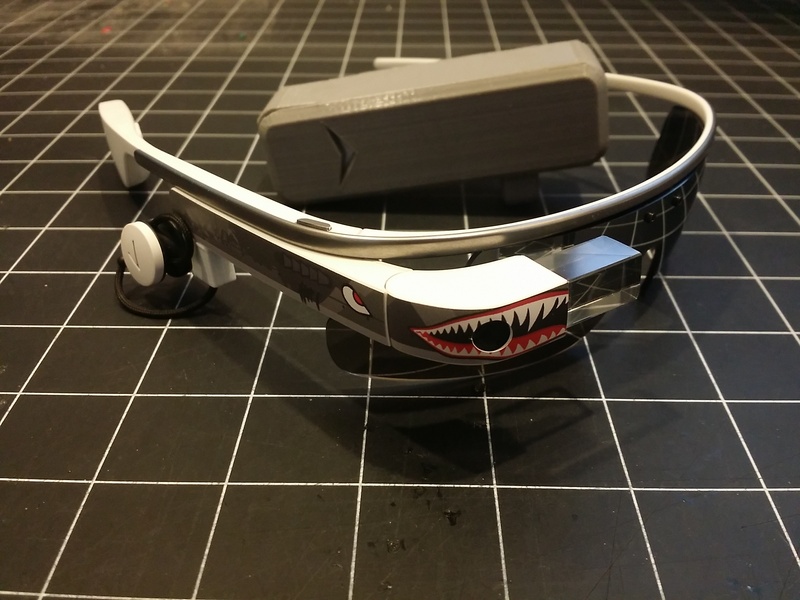 The power of wearables like Google Glass come from both the functionality and the looks. Since each wearer is so unique, and the superpowers he needs are so specialized, accessories are important to turn an off-the-shelf device into something he’ll wear every day. Here’s how I mod my everyday wearable. 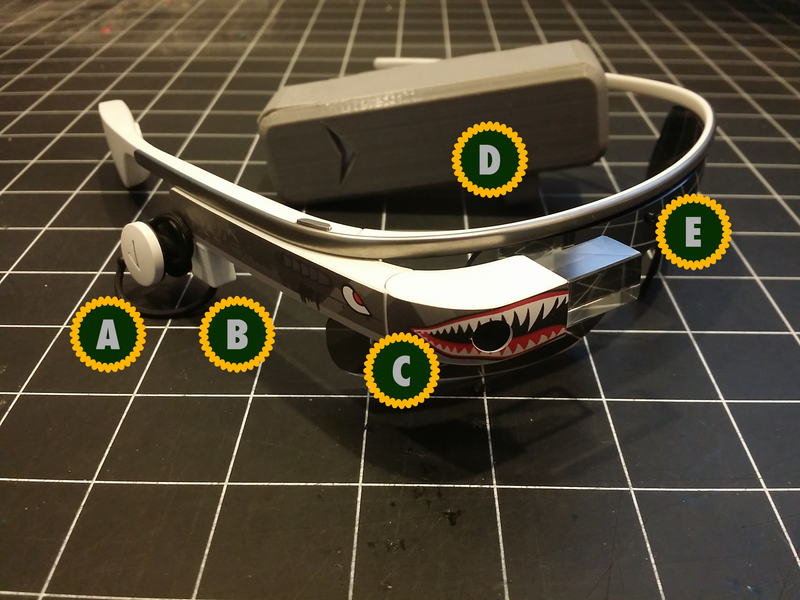 A: Google Glass stock earbud. I’m increasingly convinced that Glass was designed with the earbud in mind. It’s next to impossible to take calls or read things aloud without it, and Glass’ transducer leaks sound. The last thing you want is to annoy people with your notification chime, or worse, the camera sound in a silent auditorium. Wearing the earbud also signals that you’re occupied, which makes voice commands less awkward. B: Voidstar StickyBud. I eat a lot of my own dog food! The stock earbud just dangles there, so I designed this magnetic dock to hold it when I’m not listening. The Glass earbud isn’t really usable without this. I posted about the StickyBud’s design process, and you can buy them online pretty cheaply. This is my absolute favorite accessory. C: Custom Gpop. Style matters, and I love Virginia Poltrack’s Gpop decals. The stock white Glass looks a little sterile and Apple-y for me, so I sent Virginia a custom design with authentic WWII Tiger Shark nose art! The decals are ultra-light and apply so smoothly, the design looks printed directly onto the Glass. She even has carbon-fiber-textured and metallic Gpops. D: Voidstar Tactical Cell. The Glass accessory that started it all, I prototyped the Tactical Cell years before Glass was even announced. This is a belt-mounted battery that can recharge Glass as you wear it. The firmware team has actually done a phenomenal job of increasing runtime (something like 12 hours of occasional use!) but calls, navigation, video, and Web still eat enough battery that I like to be careful. I also sell these online. E: NextGenLens Low-Profile Mirrored Shade. How could I wear a heads-up display that isn’t a pair of mirror shades? This aftermarket sunglass lens is cyberpunk as f–k and looks straight-up Gibsonian. It’s also totally professional for an aftermarket part – polarized polycarbonate optics, rounded and pebbled edges, precise fitting, all the trimmings. NextGenLens has many less-80’s styles, including, of course, rose-tinted. So you’ve seen my Google Glass. What’s on your wearable? This entry was posted in Products, Swag by Yours Truly. Bookmark the permalink. On my Glass: prescription varifocals in Thin frame; stock earbud (colour match to Glass which requires buying the stereo buds); StickyBud (as soon as it arrives); EasyAcc 18.5Wh cell (same dimensions as my Nexus 4); long, thin & flexible USB cord. Did you receive your items you where waiting on or have they been out of stock since november last year? For historical record: I took the StickyBud and Tactical Cell off Tindie for about three weeks during March 2015 as I relocated my lab to Manhattan. If an item is out of stock, you can always visit its product page on Tindie for an up-to-date restocking estimate. How long do you think until the StickyBud and Tactical Cell are available/In stock?? Also how the heck do you add decals to your cart on the GPOP.us website?? There is no option to? As of March 2015, I temporarily stopped producing Glass accessories as I moved Voidstar Lab to Manhattan. They should be back in production early April 2015. If you’re having a problem with the Gpop site, you’ll need to use their contact form or hit them up on Google+. I’m not affiliated with them. My super-special Tiger Shark Gpop is a custom design that I special-ordered. Feel free to use their design-your-own tool to make your own!